Two of Gaelic football’s leading midfielders have voiced their opinions on the proposed introduction for a mark in 2014. 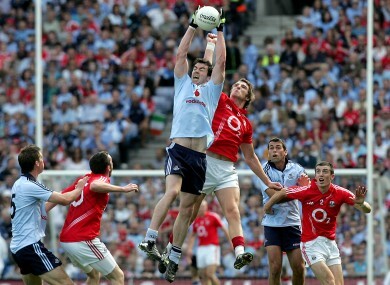 Cork's Aidan Walsh and Dublin's Michael Darragh MacAuley. The proposal is to go forward to GAA Congress in Derry in March. If passed it will then be implemented for the 2014 campaign. A mark will be awarded if a kick out is caught cleanly on or past the 45-yard line. The player will have the option of playing on immediately or if he intends to avail of the mark, he must indicate this to the referee. If an opposition player deliberately blocks or impedes the player taking the kick, the referee will penalize the opposition and bring the ball forward 30 metres. Dublin midfielder Michael Darragh MacAuley, speaking this week at Setanta Sports launch of their Allianz Leagues coverage, is eager to promote high fielding but is concerned it may slow down the game. “I think they should start looking at it, how the high fielding aspect is gone out of the game. I suppose lads just go in swinging fists now, with no intention of catching the ball. Cork’s Aidan Walsh offered similar views to MacAuley. Meanwhile Walsh has termed the new experimental black card rule as ‘ridiculous’. “I think it’s ridiculous to be honest and it puts a lot of pressure on referees to make the right decision. A tackle that gets a yellow card now – if they brought in that rule would you have to do something worse to get a yellow card? Email “MacAuley and Walsh offer support of the mark”. Feedback on “MacAuley and Walsh offer support of the mark”.